I thought I would share my newly build homeLAB setup with you. I use this environment for testing various VMware software and other tidbits. 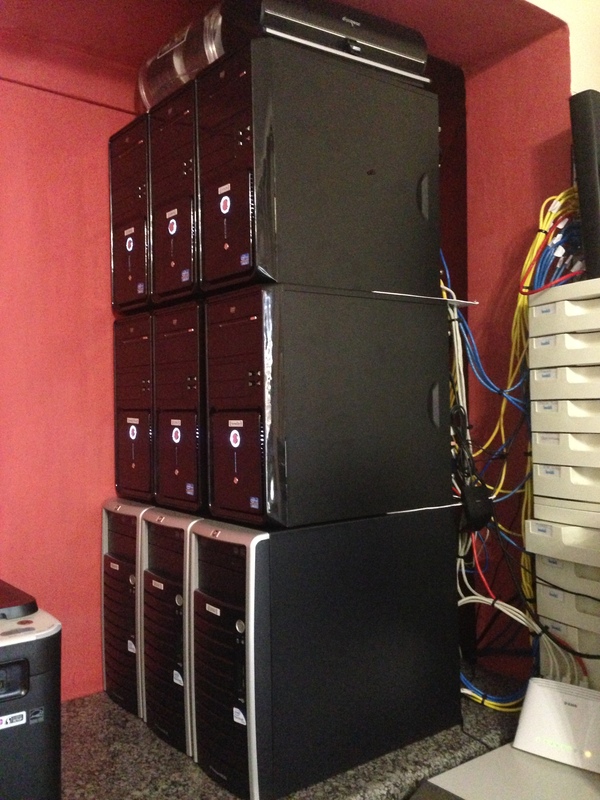 The above servers was the start of my lab….but as you can see very limited in Memory. They now form my vCloud Director 1.5 Provider vDC compute power! The above are each hosting a vCenter 5.1 server with loads of VMware software I am testing and working with. The above are each secondary servers to the servers above them…IE: two Datacenters, One Cluster, two Hosts. The above is my Domain Controller, DNS, DHCP, TFTP, Some Management tools etc. The above is my home filestore….It also doubles as my home PC if I want to rip some movies/music, play some games etc. I have an iSCSI multipath setup using Starwind as my iSCSI provider etc. Most of the boxes are empty…only MB, Ram and CPU so heat is not that big an issue. I like the setup as the noise level is low….and I can deal with the minimal heat with an Air conditioner in the room. I am looking at View 5.1 in the near future. I am also looking at upgrading two hosts (currently with 16GB Ram) with additional 16GB Ram to take them to 32GB. I am also looking at creating another PC for my use and reserve the homestor server(PC) for fileserving only. Then I am also looking forward to vSAN (or something) and maybe PernixData (once they go GA)! I shall expand on the networking in the next block and also on some of the software I use. PS: All management is done via my trusty Dell e6320 Laptop and an additional LG 23″ LCD monitor…..because you NEED a big screen for vCOPS! !